Much like the seasons, home decor changes over time. Before the Industrial Revolution, home design maintained a focus on luxury and grandeur. The Progressive Era challenged these fundamentals by drawing inspiration from quality craftsmanship and minimalist design. Architects began cultivating radical thoughts on home structure and experimented with simplicity. One prevailing notion was how the home should be basic, functional, and well-built for anyone to live in. These differing viewpoints would lead to the development of transitional and traditional design. But how well do these styles compare and contrast, and why choose one over the other? Learning more about them could help inspire your own decor ideas. Traditional design leans toward historical accuracy. Each home represents a picture of the past; painted with nostalgia for 19th and 20th century architecture. Space is evenly distributed with attention towards cultural aesthetics. Easily identifiable through medium-toned wood finishes, high-grade veneer, antique furniture, and metals such as brass or gold. Colors are varied, with neutral colors complementing lighter or darker hues. Here you can see these incremental details in action. This dining room strikes an equilibrium between its form and functionality. A solid wood finish with carved legs support this table’s foundation. Colors complement and flow with a sense of organization. These objects maintain symmetry and space to portray a calm, inviting atmosphere. Synchronizing these elements together evokes the warm feeling of eating in a humble home. 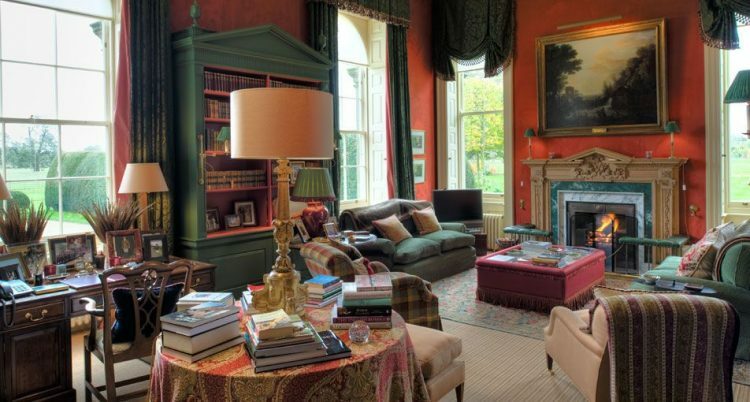 Here’s another photo of traditional design in the living room. Elements like space are portrayed differently, but the principles remain the same. The room is filled with a substantial craving for knowledge. The definitive themes of culture merging with decor mark the embodiment of traditional design. Transitional design has distinguishable differences, but many similarities. It is well known as a mixture of traditional and modern home styles. Recognized with high-quality fabric, neutral colors, and minimalist artistry. 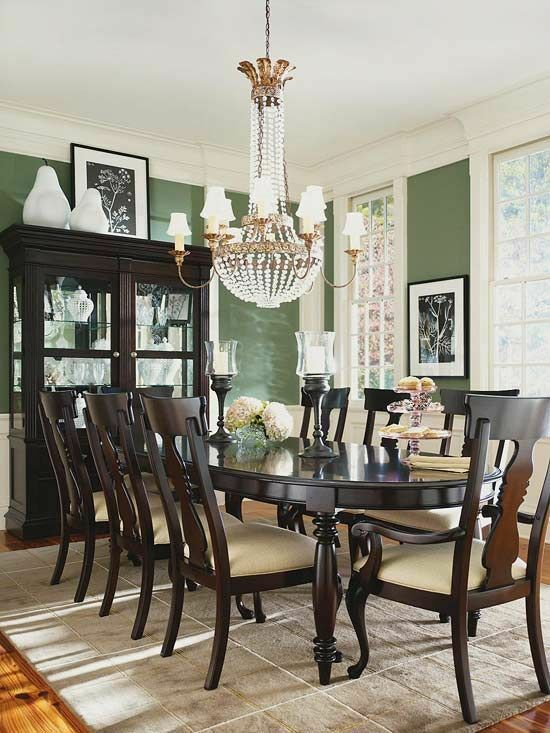 There is a notable lack of color, but dark brown is used to add depth to the neutral balance (vanilla, tan, taupe). Combine the sleek set pieces with exuberant decor and it coincides with clean lines for an acute presentation. Successfully merging old and new in a harmonious balance. 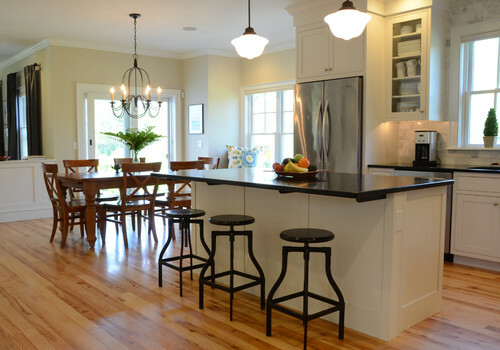 Here is transitional design exemplified in the kitchen. This kitchen’s colors are a great example. The brown wood floor contrasts with neutral colors; brightening up the room. The breakfast bar feels vibrant and contemporary with unique lines and simple bar stools. Sitting adjacent to the wooden table adds an impact to the space that splits modern and classic aesthetics. Here’s a closer view of transitional design in the living room. Curves and parallel lines spread life across this old-fashioned room. The sofas add modern appeal to older set pieces in the background; bringing the best of both worlds. The epitome of transitional design is creating a timeless, yet fresh environment. We offer an impeccable level of quality you can’t find anywhere else. Whether influenced by transitional or traditional design, our passion is ever-present in the products we produce. Here’s an example from two of our popular residential brands. These items belong to the Meadowlark Collection from Curia & Co. A lovely depiction of mid-century modern aesthetics that effortlessly re-create the transitional look. This brand is notable for distinctive case goods and vintage furniture that create an urban flair in the living room. Revitalizing timeless designs for the modern home, the Meadowlark Collection has everything you’re searching for. Stools like these are found in the Austin Collection from Avenue Six. Designed with a classic feeling for modern sophistication, the Austin Counter Stool provides durability with comfort. This brand showcases different chairs and ottomans to match the room solutions you’re looking for. Perfect for any traditional or transitional home, Avenue Six is ready to furnish your lifestyle. You can visit our website to learn more about the products we create. It can be difficult to craft a chic interior design. Homes are blank palettes; easily subjective to our preferences and opinions. The presentation ultimately rests on the designer’s shoulders. Which particular style do you prefer? And how would you decorate it? Let us know in the comments below. Awesome blog. I love this furniture especially the traditional look! Please contact us at social.media@officestar.net so we can follow-up on your question.